At present time, air purifiers are widely used and highly recommended for house, office or any indoor atmosphere. The reason is simple. Rapidly, the air in our atmosphere is getting worse. Now people realize it’s much worse when it comes to indoor ambiance. You may or may not quantify how much polluted the air is in your house. Hardly, we can see the pollutants in our bare eyes. Yet, the tiny particles that exist in the air contain germs, bacteria, and toxins that can cause serious illness eventually. The surprising fact is; these pollutants are not coming from the outdoor environment. They are mostly produced from the components that are in our house like a sofa, carpet, smoke particles, pet dander etc. when you see fungal infection, dust mites, mold or pollen; these are also detrimental for our health. All of these pollutants can cause allergies, breathing problem, lungs cancer and even damage to our respiratory system. If you have already observed these symptoms, you may consider buying an air purifier immediately. Because no other devices can quickly and quietly remove the airborne contaminants as an air purifier can do. The first and foremost thing we need to ensure a strong immunity system is breathing good quality air. Being in a polluted atmosphere, we also intake the pollutants inside us. Every house tends to regularly maintain dusting, deep cleaning or even vacuum cleaning. But, none of these processes can remove contaminants from the atmosphere. Thus, to effectively remove the harmful pollutants from the air, the experts have specially designed this atmosphere. Let me elaborate on how an air purifier can do to improve the indoor air quality and subsequently to your health. Our indoor air is contaminated with different sizes of particles. Usually, there is mold, pollen, dust, mites, allergens and so on. When you have a pet at your home, the contaminants include pet hair, dander, and odor. Even if you smoke, the smoke particles get stuck on the surface or float in the air. These pollutants are so tiny that one cannot be completely removed with traditional ways. But, when you install an air purifier, you can be tension free. A good quality air purifier contains a HEPA filter. When the device is turned on, the contaminated air is pulled into the device. There, it passes through the HEPA filter that pulls out the microns of pollutants and removes from the atmosphere. As the air is purified and ensured germ-free, the device sends out the fresh breathable air to the atmosphere. From the study and experiments, it has been proved that a HEPA air purifier has the ability to remove 99.97% of airborne particles. Even it can capture the tiniest size of particles up to 0.3 microns. There have been no other devices as effective as a HEPA purifier so far. So, once you install, it will remove maximum airborne impurities and eventually you will see a noticeable change in the air quality. Along with the pollutants, we often need to deal with unpleasant odor at the house. Especially, when there is a pet or a smoking person lives in the house. The nauseating odor makes breathing near to impossible. Therefore, when you install an air purifier, it will effectively remove all sorts of odor. You can also install an air purifier at your home, office or car. No matter how bad the smell is, the air purifier will immediately remove the smell and give you fresh air to breathe. When the family members in your home are often seen to be sneezing, coughing or suffering from a breathing problem, know that the reason is the poor air quality. In a usual indoor atmosphere, we breathe in the contaminated air and send out the same pollutants to the air as we breathe out. It’s a repeated process and the pollutants keep circulating in the atmosphere. As we have already discussed, an air purifier can successfully capture and pull out even the tiniest pollutants from the environment. Thus, when you continuously intake the pollutant-free fresh oxygen every time you breathe in, it will see a noticeable improvement in your health condition. 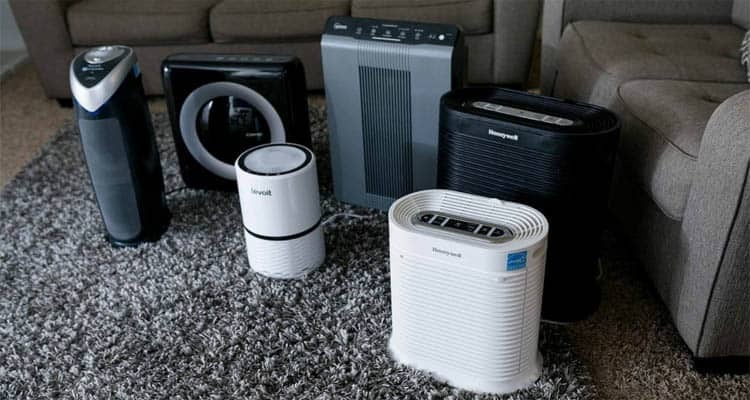 Air purifier users who are sensitive to allergens and have reported that after consecutive use of an air purifier, they seem to have a less allergic reaction and asthma problems. Also, there will be almost no existence of germs and bacteria into the air, your family members will be safe from fever, skin rashes and bacterial problems. It's true that an air purifier is not a replacement for any house cleaning device. Even though the device can pull out near to 100% pollutants from the air, it doesn't mean you don’t need to clean the furniture, carpet and other items. But, one thing to ponder; when you don’t have an air purifier at your home, how often do you do dusting? Quite a lot right? Because when you do, the dust, dirt or other components float in the air. Thus, after a while, you see them on the top of the kitchen cabinet, table, and sofa and so on. With an air purifier, as you do dusting, the device will capture all the particles and get rid of from the air. It means there will be the low existence of pollutants in the atmosphere. Therefore, as the device is continuously in service, you will eventually realize reduction of the dust, dirt, hair, dander and other contaminants. So, even if an air purifier can only clean the airborne pollutants, you will feel the lack of need to clean the house more often. It will help you to save the time and energy. Wherever you want to install an air purifier, you will surely be able to gain all the benefits of it. Whether you are working at home, riding a car or staying at home, the device will provide you with the most possible clean and breathable air. Air purifiers in these days are available with diverse technologies. But, all of them seem to provide the desired outcome according to the user’s need. So, in order to ensure the strongest respiratory and immune system with the safest air to your family members, you can undoubtedly trust on an air purifier.